When buying electrical equipment, you want more than just hardware. You want an efficient electrical system designed around your company’s unique production process. ESSCO Electric Service & Sales has been a market leader for 60 years providing quality solutions in plant automation, motors and motor control, and electronic repair service. Our extensive experience in a wide range of industries throughout the region uniquely qualifies ESSCO as a preferred supplier of industrial products and services. Our Branch Manager, Operations Manager and Engineering Manager combined represent over 85 years experience in our field providing a high level of expertise and service available to our customers. We are a company dedicated to providing the highest quality products, technical know-how and service. Our main office and stocking center is located in Greensboro, NC. We have sales staff across North Carolina, South Carolina, Virginia and Tennessee to provide on-site customer support and service. 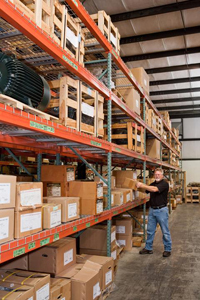 We maintain an extensive inventory of AC motors up to 200HP, motor controls and AC variable speed drives up to 100HP.